iWindsurf Community :: View topic - alternate foil ?? Posted: Tue Nov 28, 2017 3:31 pm Post subject: alternate foil ?? have seen some discussion about what i will call "quasi-foils"
any trials n tribulations on these alternatives ?? Looks like these are attempts at quasi-foiling (i.e., just reduce the wetted surface of the board, but not lift it totally clear of the water). My guess - lots more drag with little to no performance benefit. 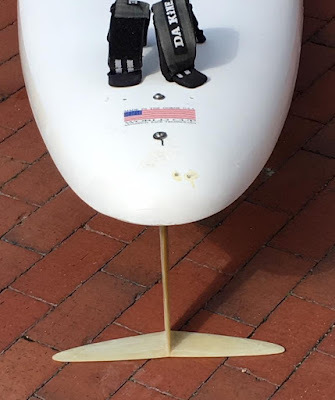 These foils are too small to lift the board and rider out of the water and too far back relative to the CG of the rider+rig - any lift would just drive the nose down. Again, this is just an assumption based on comparison of what I've seen on foils that have been proven to work. Yeah I think these could work. I've also seen these pics and read a bit of their info. They wouldn't be for a "windy place"... but in a light wind location, they could be fun. And these designs are just the beginning. If these kinda work, then better designs will follow. Yes, the point with these isn't to fly above the water... but just to reduce the wetted surface. And when you do that, you will speed up. It's the same with my LP foil... if it's not windy enough, with effective pumping to get airborn... I still raise up a couple inches in the water, and suddenly I'm going faster. For example, I (200 lbs) can be in steady 10 mph wind, on my FW with foil, and with 8.5m sail... and I can pump like crazy. And sometimes I don't get flying, but I do start sailing fast. The friction is reduced, cause I'm riding high on the water, and the speed maintains, cause there's enough wind to keep me going that fast, coupled with less drag. It's exactly like when I'm on that board with 70cm fin and 11.5 race sail, and steady 10 mph wind. I pump like crazy, and the board starts planning, and I speed up. It seems very similar to me, but I'm not an expert FW racer. Anyway, everything is the same... except in one case I have a 70cm fin and a 11.5 race rig... and in the other case, I have a foil and an 8.5 free-ride rig. As we know the foil wing raises you up... but if there's not enough wind to fly... you can still get raised up enough to plane. 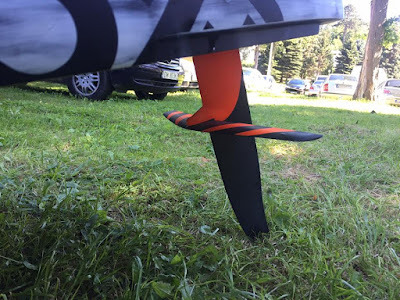 These fins with small wings built in... look like they would work. Once you get about 10mph board speed, they will start lifting everything "up". And if these work, like the theory... it would be great for bigger guys, in light wind areas... where you're never planning, but your lighter weight 170 lb. friends are planning. Add this "special wing fin" and maybe you'll be planing just like them. I wonder if a foil system will ultimately go faster on a real speed course. Specialized stuff, of course. Only somewhat useful comparisons I've seen is between foil course racing vs formula course, where foil gets better angles so far. Is that applicable to rec sailing? Since I sail 99% back and forth, would foiling add anything besides a new/different sport? I do acknowledge foil can use about 1 to 1.5 smaller sails in beam reach sailing, at the expense of the "FEEL" of carving, jumping, and going fast. There's no reason, the everyone will get into foiling. And, I think you're right - For you, foiling wouldn't add anything besides a new/different feel. Since your focus is sailing BAF, and also you're a lighter guy, and living in a windy place, and with a ton of experience / skills... you are always planing and going fast. Your focus is speed, slashing jibes and jumping... I agree adding a foil, would only be that you want a new challenge. And it'd be something to play with on your rare light wind days. I got it cause I'm in a light wind place... and I thought it looked cool... and it's really fun and a big challenge for me (200 lbs) in 10-20mph wind (which is a high wind day, here). For me steep angles are fun. Feels like I'm actually going places. Carving really tight low speed turns is also fun but that depends on the foil I'd say. If I was 150# and lived where I got 15 kts most days I'd never touch one. You nailed it. 160 lbs., 109 liter and 7 is biggest gear I actually carry, both my 13 lbs 124 slalom and my formula has'nt left the garage more than 1 week per year in the past 3 years. And since n my 95 liter slalom carries a 7 meter sail really well, I've not had the 109 in the van since July. But still, for the occasional 7 to14 mph breezes, a foil..we have the Naish..is a smaller package than Formula and 7.5 sail. Did you get the Naish foil and his foil board too? Anyway yes... I guess you decided to just add a new challenge (a new sport, as you said) for those rare light wind, 7-14 mph days... that you have there in the Bay area. Looking forward to your reports! Windfoil ia availible everywhere, but only one run of boards came through so far. Gone by mid Oct.
Got a 150 Shark, 140 Exocet WARP, and 2 Formulas that work. My 109 SuperSport should be plenty big also with a 70cm mast length. But when wind died in late Oct., it died to 2-7 mph from over 17 in the gusts in Oct. I'm finding that where I am I've either got enough for shortboarding (including free riding formula with 8.5-9.5), or else it's light but with gusts I can't quite build enough speed in and on those days I'd rather longboard. So for me it's not really filling in any holes either. However I see the appeal for people who only have <8m sails and don't enjoy just simply going places.